Crabs are harvested using a variety of methods. Recreational crabbers, or "chicken neckers", may only use a piece of bait tied to a string while commercial watermen use crabpots or trotlines. Most recreational crabbers use chicken necks for bait since they are considered scrap, are very durable, and crabs love them! Commercial watermen, on the other hand, prefer to use various types of oily bait fish, eel, and bull lip. Some watermen use frozen fish because it tends to break down (decompose) faster than fresh which seems to attract more crabs. Eel - Cut into 4" pieces, eel is the ultimate crab bait and is used extensively by commercial crabbers on their trotlines. Because eel is considered a delicacy in Europe and Asia, its price has risen sharply thus making it prohibitive to use as bait. Bull Lip - A tough cut of meat from the facial area of beef. Bull lip is fast becoming the bait of choice for trotlining since it is durable, inexpensive, and crabs love it. Bull lip is easily obtained from any beef slaughterhouse. Be sure to have an axe handy to chop it up! Menhaden (a.k.a. alewife, shad, bunker, shiner, pogey) - The bait of choice for commercial crabbers utilizing crabpots. Menhaden is very plentiful, is relatively inexpensive and is an excellent crab bait. It is said that frozen menhaden catches more crabs than fresh, however frozen does not last as long. Since most watermen tend their pots daily, which includes re-baiting, the fast decomposition of the bait is not a problem. Make sure you use fresh if you plan to let your pots sit for several days. Chicken Necks - A good bait which is used mostly by recreational crabbers ("chicken neckers"). Usually used with crab traps and hand lines. Turkey Necks - A good bait which is used by both recreational and commercial crabbers. Turkey necks are durable and will generally last several days when used on a trotline. Can also be used with traps and hand lines. Invented by Benjamine F. Lewis in the 1920's, patented in 1928, and perfected ten years later, the crabpot changed forever the way hard crabs are harvested on the Chesapeake Bay. The crabpot is the most common method used to catch and harvest crabs and is used worldwide. Click here to learn how to make your own. The crabpot is a large square trap constructed out of galvanized chicken wire (some new pots are constructed out of PVC (polyvinyl chloride) coated wire. Be warned that these "plastic" pots become dirty very easily, becoming contaminated with marine growth and barnacles. Also keep in mind that these pots must utilize stainless steel frames and clamps which drives up the cost.). The trap has two internal chambers. The bottom chamber, or "downstairs", consists of two or four entrance funnels, known as "throats", which allow the crab to easily enter but not exit. In the center of the bottom chamber is the "bait box" which is constructed of fine-mesh galvanized wire so that the crab cannot get to the bait. The top chamber is the holding area, known as the "parlor" or "upstairs". Crabs enter the parlor through oblong, funnel-shaped, holes cut into the floor of the parlor making it difficult for the crab to swim back downstairs. Crabpots are ingenious contraptions in that they utilize the crab's very own escape instincts in order to trap them. Crabs smell the bait and circle the pot, entering through one of the throats. Once inside and unable to reach the bait, the crab feels trapped and threatened. When threatened, a crab instinctively swims up towards the surface to escape, where it winds up inside the parlor. It remains in the parlor until removed through a special opening along one of the top edges. Most crabpots have two small exit holes up high in the parlor called "cull rings". These rings are big enough to let small crabs escape yet small enough to trap the larger keepers. Jimmy Potting - During the last two weeks of May, watermen will bait their pots with several live jimmies placed in the pot's parlor (or use a special "peeler pot") which lures large mate-seeking peelers (she-crabs that did not reach the terminal or mating molt the year before) into the pot. While this method works using a regular pot, it will only catch a few peelers because once a jimmy doubles-up with a female other females will not seek him. The use of a peeler pot is preferable which does not exhibit this problem. Bare Potting - Involves setting an un-baited pot down deep in the barren channels. Crabs see the pot as a hiding place and will enter the pot. It's usually only practiced for several weeks in the spring. Peeler Pot - A specially designed crabpot used to catch mate-seeking female peeler crabs. A peeler pot is similar to a standard crabpot except that instead of a bait box, it incorporates a special holding cell where a live male crab is placed. Mate-seeking female peeler crabs are attracted to the lone male and will enter the pot and become trapped. Peeler pots can be utilized all season long and work remarkably well. A trotline is the tool of choice in the area near the Chester and Wye Rivers on Maryland's Eastern Shore (actually, in those areas it's the only choice that's allowed by law!). A trotline is a very long line (it can be over a mile in length!) which is anchored with heavy weights on each end (some watermen use scrap engine blocks as anchors.) The line is baited at specific intervals and is allowed to sink to the bottom. The waterman will start at one end of the line by pulling it up and draping it over a roller attached to the side of the boat. As the boat moves down the line, the line, bait, and hopefully crab, are slowly raised towards the surface where the watchful waterman will scoop up the crab with a dip net. This method makes for very long, hard, tedious work. Most watermen prefer to use eel for bait since it is more durable than other baits and can be reused many times over. At the end of a long day of crabbing, the trotline is pulled aboard and stored in a barrel of strong brine solution which helps preserve the bait. Recently, many watermen have switched to bull lip for bait instead of eel since it is significantly cheaper. The crab dredge is used only during the winter months to dredge up crabs which have burrowed into the bottom during their winter dormancy. The crab dredge is about 6 feet wide, weighs 250 pounds (dry), and resembles an oyster dredge. Both employ the same structural design and have "bags" or netting made of chain in the lower half and twine in the upper. The crab dredge has long tines or teeth that can be adjusted at various angles so as to rake the bottom (they are set according to the bottom hardness and how deeply the crabs are buried). Properly set, the tined bar will force up bottom mud or sand in neat curl like snow in front of a road plow. In the curl are rudely awakened crabs. Strictly a recreational activity, trapping crabs can be lots of fun and very productive. Since a boat is not required to trap crabs, it is a popular method of crabbing. One method is to crab from a public bridge; you'll know when you find one because other crabbers will be there. Crabbing from a public pier or dock, say at a marina, is another great way to utilize a trap. Wading out into shallow water and tying off your traps to sticks or poles is yet another way. And of course, a boat makes an excellent crabbing platform! Ring Net - The ring net is the simplest and least expensive trap available. It consists of two rings each of a different diameter connected by netting. When baited and lowered to the bottom, the trap lies flat on the bottom. The crab will then approach and start to feed on the bait. When the trap is pulled up the top ring is lifted first this trapping the crab in the netting. The benefits of this trap are its simple design, ease of use, ease of storage (it folds completely flat), and its low cost. The drawbacks are that it only works in relatively calm water with flat sandy or muddy bottoms and that it must be lowered very slowly straight down. Pyramid (folding star) and Box traps - These traps work similarly in that they are made of metal and have sides that swing down (open) when resting on the bottom. They are more expensive and complicated than the ring net but can be used in stronger currents and bottoms covered with small rocks and marine growth. They can be "thrown" or "swung" into position. The pyramid trap (shown at left) can be easily stored since it folds completely flat but is very cumbersome to use and fouls frequently. The box trap is bulkier but works consistently and remarkably well. It is the trap of choice among recreational crabbers. 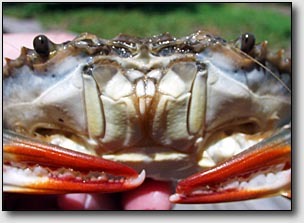 The simplest method of crabbing is a hand line and dip net and is strictly a recreational activity. The bait along with a small weight is simply tied to a line and lowered to the bottom. The crabber, feeling the light tugging of a feeding crab, slowly pulls the line in, and, when the crab is just visible beneath the surface, is quickly scooped up with the net. This is a very inexpensive, low-tech, way to catch crabs and is a great way to get the whole family together! Make sure your dip net's pole is no longer than six feet or it becomes difficult to handle. The most basic of all methods, scapping involves the age-old "man against crab" ploy where a man simply takes a long-handled dip net (scap net) and wades through the water looking for crabs among the eelgrass (no bait is used). This method is practiced when hunting both hard and soft-shell crabs. 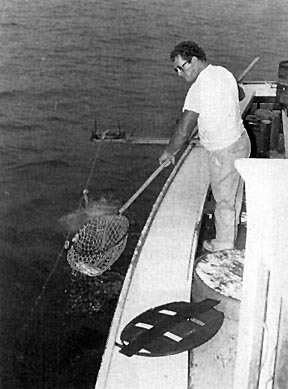 An alternate method employs the use of a small boat where the crabber stands on the bow and uses the net's pole to push himself along near the shore. Crabs seek shallow water where they can hide in the eelgrass in order to molt. Once a crab molts, it is extremely weak and cannot easily swim away. Once spotted, the crabber simply scoops it aboard. Scapping hard crabs is best practiced at night with a lantern or bright light. Nocturnal crabs can be easily spotted swimming near the surface. Some claim that shining a bright light into the water will attract curious crabs.